Two of the most ardent supporters of disgraced Arroyo Grande City Manager Steve Adams will pick a consultant to find Adams’ replacement at an estimated cost of $26,000 if the city council approves a staff proposal on Tuesday. Mayor Tony Ferrara and Mayor pro Tem Jim Guthrie “will interview and recommend” a consultant to seek a new manager from a statewide pool. Adams has been on the employment hot seat ever since he was discovered by police in his darkened City Hall office near midnight July 3 with a subordinate employee, Community Development Director Teresa McClish. He has since issued several public statements in which he denied that anything improper was occurring when police, responding to a call for assistance from McClish’s husband, found the couple in what officers later described as “an uncomfortable situation.” Adams said the pair was “drinking tea” in an effort to sober up after attending the opening of a nearby restaurant. Adams, who has held his post for 14 years, has said he will depart the city when his replacement is chosen, a process that could take up to nine months and one in which he likely will participate. City employee sources have suggested to CalCoastNews that an effort is being made to allow Adams to maximize retirement benefits. Despite Ferrara’s determined efforts to protect Adams’ job, the council — grudgingly and after weeks of intensifying pressure from a growing number of city residents — decided to call for an independent investigation into the incident and its aftermath. Ferrara is the newly-elected president of the statewide League of California Cities. The ongoing brouhaha has given birth to a write-in challenge by Jim Hill, who has been mounting an swiftly-moving campaign in the village of 18,000. I have attended just about every City Council Meeting, including the urgent meeting on a Thursday morning at 0900, because I am NOT SATISFIED as a Citizen of this City after learning about the Tea Party of July 3, 2014 and subsequent questionable actions. It is my right to attend, speak out and wear whatever I want, in support of whoever I want, based on my rights to do so, spelled out in the U.S. Constitution. Just because I don’t happen to support what or who you do, does not make me or anyone having similar beliefs a group using “Mob Tactics with Unproven Facts”, and it especially does not make me or my MOB (whoever that is) an “Intimidating Vocal Group that has hijacked the City Council”. Oh, and, who am I or this mob holding hostage? Our presence here is to be heard, and if you find that intimidating or uncomfortable that is a personal problem I have no help for. Those of us who are holding this City Council and Staff accountable are being turned into the bad guys. Give me one example, other than showing up to an open government meeting and expressing concerns, and/or complaints, what makes you so fearful, the truth? Let’s not forget why we are ALL here to begin with…Steve Adams violated the law and city policy, the City Council kept it under wraps and failed to appropriately handle the situation from the beginning. This could have all been settled long ago, but the Council holds the power. Unknown author(s) of a ridiculous website “free AG Council.org” makes numerous allegations with NO PROOF that this is all a labor ploy by the AGPOA. The insinuation that any member of the Arroyo Grande Police Department did ANYTHING improper or illegal is offensive and slanderous. They did the job you have hired them to do. The AGPD has used “PROOF” to answer those that have questioned or accused them, unlike City Manager Steve Adams who keeps enhancing and changing his story to fit the facts that have always remained the same in the Police Memorandums. Adams with his polished ability to deflect his actions onto the POA inferring they have lied which by inference makes them less than honorable, and he put it in writing! This has caused the public to question the police and their character and integrity, as evidenced in this free council website. The issue with regards to the AGPOA having this ulterior motive regarding the July 3 incident, especially the one eluded to by City Manager Steve Adams in his one page FREE AD in the Tribune on 10/2/14. Adams passive aggressive suggestion, really an accusation, in this AD against the AGPOA, alludes to the Labor negotiations, and tactics that appeared on a defunct law firms website referred to as a “PLAYBOOK”. But the one thing Adams fails to realize in his self-aggrandizing piece in the Tribune, Commander Kevin McBride isn’t a member of the Arroyo Grande Police Officers Association. The Commander position is considered management and a conflict of interest, therefore that “questionable labor attorney” doesn’t negotiate with the City on behalf of Commander McBride. So I guess that INNUENDO of AGPOA using these Playbook tactics is dead in the water…Oh, and Commander McBride has 30 years of Dedicated Service to this Community, not to mention a local !! The “Save AG Council” needs to save themselves from themselves! I am not threatened by you and YOUR MOB! I have no problem with you having a different opinion that is based in truth and fact, this is your right, and that is the rub…YOU are basing your argument on fantasy and lies told to you, that you naively accept. I have seen not one current employee come to the support of ANYONE involved in this fiasco, except the Police. They didn’t lie, and there’s no way around it. This one incident has caused so much turmoil and emotions that the opposite of what they wanted, to keep it quiet (Cover-up) has exposed a lot of questionable albeit illegal goings on in the City of Arroyo Grande. 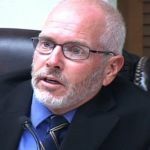 This Mayor and Council has continued to support a “reprimanded” City Manager, even after he wrote an opinion piece pitting city employees against each other, deepening a hostile work environment. In that same piece Adams conveys confidential negotiation information with his slant to make himself look good and blame everything and everyone other than his own actions for his decision to INTEND to Resign. You City Council Protects that behavior and betrayal by supporting it, and not all the other City Employees. It is Steve Adams actions and writings that have caused the problem and the City Council’s lack of proper response to the situation. Do you think any of these employees feels comfortable saying anything given these circumstances? I sincerely hope they will speak freely during this expensive investigation. I am going to keep demanding Adams immediate termination. Adams has shown so much disrespect and disregard toward this City, it’s employees and residents, and somehow he still seems to be dictating to the Council how this situation will be handled, and they let him (as evidenced in his intent to resign). He SHOULD NOT be involved with the selection and/or training of his replacement. I also believe the City Attorney should be terminated as well due to poor and costly advice, that the City Council seem to keep taking. I am going to continue to support the TRUTH and DOING THE RIGHT THING…this is my motive. The AG City Council need to do the same, quit protecting these Puppets/Administrators and support the employees for once! 1. put out ad in craigslist. 2. review resumes against online profile to ensure no candidate has been involved in scandal. 3. interview small remaining pool. 4. choose most ethical city manager and give them huge raise cuz its commensurate with SLO! So Tony or Steve thought it was okay to open the doors to the city chamber at 445pm, I have NEVER seen that happen before, but Tony wanted his cronies in there first. Amazing some of our BIG signs that we had a Von’s supermarket are gone today, along with many others that we had permission for. Kristen feels free to call the police directly to ask them to remove signs SHE does not like. Talk about a waste of city services. But then they are calling businesses upward of 200 times a day, so business owners have to take the signs down if they want to have REAL customers call. Intimidation tactics are not becoming of our mayor and council. Good thing for cameras on cell phones, like they say a picture is worth a thousand words. Can’t wait for show and tell at the next council meeting, we have pictures to share with everyone too. Not sure why the Ferrara, “holy cow what do you mean we have to run?” a campaign crew is SO threatened by a write-in candidate, but clearly their desperation is showing. Now the fevered pitch of her obsession with all of those pesky yellow Write-In Jim Hill signs, and publicly being called out at the council meeting regarding the harassment of businesses who display them, it makes you wonder…. He is afraid of the truth coming out. Keep digging and do a financial audit of the city and the san district, the truth will come out. You forgot you can fool some of the people, some of the time; but you can’t fool all the people, all of the time. This is a heavily traveled sidewalk. Tony Ferrara had a 4 minute free commercial for his candidacy for Mayor. He even went so far as to discredit the people who have come to the meetings for the last 10 weeks sharing concerns. Tony and his terrible tree saga…part two! Last night’s city council meeting was yet another opportunity for Mr Mayor (this time with a full page color picture of the offending tree displayed on the OHP for all to see) to explain why it was SO necessary for him to call out 3 city workers, after hours, to help him deal with his tree. 2. Called a neighbor to come help, that’s what good neighbors do. Maybe even borrow their green waste container too! 3. Tied a rope around it, hooked it to your pickup and moved the stupid thing until you could deal with it. Good ‘ol Tony, the more he tries to make himself appear to be a regular Joe, the more obvious it is he’s not. employees can increase their salaries (and therefore inflate their retirement income). And also see the column by Joe Tarica in Sunday’s Trib. little drunk and decided to sober up in city offices back in July. increase their pay (and reap bigger retirement income). pay by getting as many of the ‘bonuses’ as they can. Wonder which bonus Ferrara is getting by his actions in this whole affair? DID THE AG CITY COUNCIL VIOLATE THE CONSTITUTIONAL RIGHT TO FREEDOM OF SPEECH FOR THOSE SEEKING SEATS AT THE 10-14 COUNCIL MEETING?. THEIR FIRST AMENDMENT RIGHT OF FREEDOM OF SPEECH. “CHILLING” EFFECT ON THOSE WHO WANTED TO SPEAK? TRIED IN STATE OR FEDERAL COURT. SEE THE BELOW CASE. In Monell v. Department of Social Services, 436 U.S. 658, 690 (1978), the Supreme Court established that local governing bodies can be sued directly under 42 U.S.C. § 1983 for monetary, declaratory, or injunctive relief when action that is alleged to be unconstitutional implements or executes a policy statement, ordinance, regulation, or decision officially adopted and promulgated by that body’s officers. “Every person who … subjects, or causes to be subjected, any … person … to the deprivation of rights … secured by the Constitution … shall be liable to the party injured.” 42 U.S.C. § 1983 (emphasis added). Amnesty America v. Town of West Hartford, 361 F.3d 113, 124-25 (2d Cir. 2004). Municipal liability may be based upon “constitutional deprivations visited pursuant to governmental ‘custom’ even though such a custom has not received formal approval through the body’s official decision-making channels.” Monell, 436 U.S. at 694. “This does not mean that the plaintiff must show that the municipality had an explicitly stated rule or regulation.” Vann v. City of New York, 72 F.3d 1040, 1049 (2d Cir. 1995). DID THE AG CITY COUNCIL VIOLATE THE CONSTITUTIONAL RIGHT OF THOSE SEEKING SEATS AT THE LAST COUNCIL MEETING?. REMOVING THE SEATS DENIED THOSE WISHING TO SPEAK THEIR FIRST AMMENDMENT RIGHT OF FREEDOM OF SPEACH. Jim Guthrie has shown his true sycophant colors. That @sshole has to go, as well. Gotta give him credit for hangin’ out at R&D’s for a couple of hours to do his homework on the noise ordinance! Good for you Jim, yours was the voice of reason. We also appreciate the fact that you understand what “clearly audible” means. Please share with Kristin, she still looked lost even after the attorney explained. Once again, the fox is guarding the henhouse! Obviously the vote of no confidence from the POA has had absolutely no impact on Ferraro. Just look at the limited gene pool the City has been hiring from for decades. Every City is the County recruits on the best and brightest, yet they all end up having to contract out their work. Hmmm, why do your own work when you can simply hire a consultant who pays you a little tribute in return. By the way, where did Adams go to school?